Anker Project - Anker high security cyliders, for restricted and password protected key systems, which can be supplied in keyed alike and master suite modular systems. 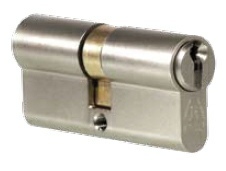 Double Euro Cylinder with Registered Keys. Finish: Satin nickel or Satin Brass. 23 Sizes: 30/30 to 50/50mm in 5mm increments including offsets. Advise Length & Split when enquiring or ordering.